If you thought that the huge movement started by Mr. Anna Hazare against corruption would have had some effect on corruption, you are certainly wrong. According to Transparency International’s annual Global Corruption barometer report, it has actually increased over the past 2 years. 71 percent of the survey respondents in India said that level of corruption has actually increased in India, while 23 percent said that it is at the same level. Only 6 percent of Indians thought it has decreased! The Global Corruption Barometer findings are based on 114,000 people interviewed in 107 countries between September 2012 to March 2013. Among the institutions that were most affected by corruption were Political parties and Police department reigned supreme. 86 percent of respondents thought that all political parties in India were corrupt, while 76 percent thought that Police department was corrupt. 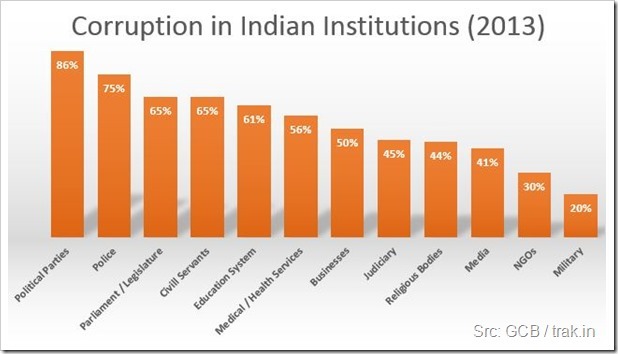 It is clear from the chart above that corruption is a huge problem in most public sector institutions with all the top 4 highly ranked are Government organizations. It is also interesting to note that 30 percent of the GCB respondents feel that corruption is rampant in NGOs as well. In the question, where respondents were asked as to which of the eight services they have paid bribes in past one year, highest percent (62) said they have given it to Police, while 61 percent said they have paid bribe to registry and permit services. If you compare the same stat with US citizens, only 7 and 14 percent have paid bribes. When asked whether ordinary people can make difference in fight against corruption, nearly 55 percent agree that they can. Also 90 percent of the respondents said they would act against corruption and two-thirds of those who were asked to pay a bribe had refused. Infact, along with the Anna Hazare movement, there have been many other initiatives to curb corruption including zero rupee note, which is is a way for any human being to say NO to corruption without the fear of facing an encounter with persons in authority. On a personal level, I think that while ordinary citizens can help curb corruption, it is the processes that can be more effective. If Government can come up with policies and processes that leave no room for corruption, it can be eradicated to a large extent. Initiatives like direct cash transfers through Aadhar card is one example where processes are effective in tackling corruption.